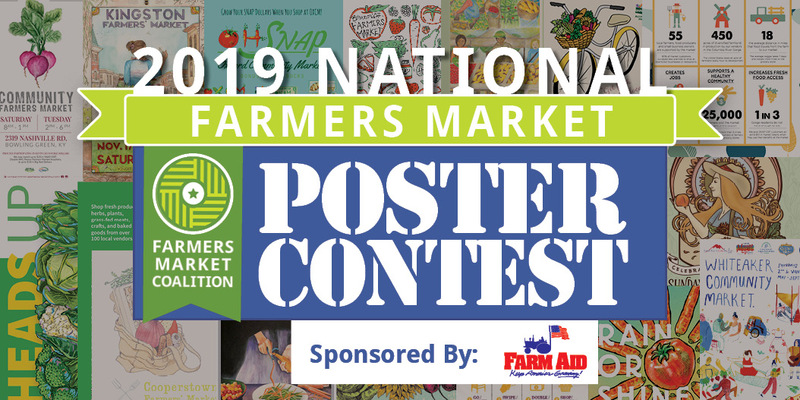 Get those posters ready – the Farmers Market Coalition is once again teaming up with Farm Aid to host the 2019 National Farmers Market Poster Contest, April 29th – May 31th! Now in its 5th year, the annual contest celebrates the creativity and diversity of America’s farmers markets by showcasing market posters on a national level. For inspiration, check out all the 2018 entries on Facebook here and our winners from 2014, 2016, 2017, and 2018. In addition to five cash prizes, ALL entries will be entered into a raffle for a chance to win TWO tickets to the 2019 Farm Aid Concert! Scroll to the bottom of this page for contest rules, prizes, FAQs, and more. Submission will be accepted until May 31, 2019, when this form will officially close. Submissions will be posted on FMC's Facebook page beginning April 29, 2019. Then they will continue to be posted on a rolling basis. This means, the earlier you submit your entry, the longer followers have to vote on your submission for the Fan Favorite prize. However, it is highly recommended that you also do additional social media promotion of your submission in order to cultivate votes, as Facebook's algorithms often make it unlikely for followers to see all posts. If you have a technical problem submitting your entry, email your entry to Liz@farmersmarketcoalition.org with answers to each field of this form. Does your poster feature market data or SNAP availability information? Posters that include market data or SNAP / EBT availablitiy information are considered for additional SNAP and Metrics prizes. Market Data can include anything from number of vendors, average distance from farm to market, varieties of produce, to survey information collected. Help us help you! Provide a link to the market's Facebook page (and other links) so that we can tag your poster properly to make it more visible to your fans. Why celebrate farmers market posters? In a recent national survey of farmers who sell at farmers markets, farmers reported the best way markets can support their business is by better advertising and signage. The trusty poster has long served as one of the most essential ways farmers markets can promote their venue. Market posters not only advertise a place where people can find fresh food for their families, they support the livelihoods of thousands of local farmers across the country by drawing communities closer to the hardworking men and women who produce their food. A true testament to the power of some simple signage! Who else is celebrating farmers market posters? Farm Aid was so impressed by the entries in last year’s competition, they decided to once again partner with FMC to sponsor the 2019 contest! For 30+ years, Farm Aid has raised over $50 million in support of farmer programs and the Good Food movement. Together, we’re thrilled to celebrate our nation’s local farmers and farmers markets. In addition to cash prizes, this year’s winning posters will be also displayed at the HOMEGROWN village tents at Farm Aid’s 2019 concert! Thank you, Farm Aid, for helping us showcase America’s farmers markets! 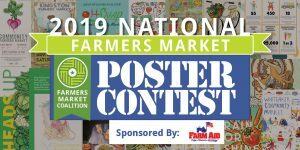 Winning posters will also be displayed at the 2019 Farm Aid concert, as well as at events in Washington D.C. during National Farmers Market Week. Our panel of judges will determine the 1st, 2nd, EBT/Nutrition Incentive, and Metrics poster winners, while our Facebook followers can vote online to crown the Fan Favorite winner. Entry must be a 2019 season farmers market poster. Anyone can enter; prize money goes to the farmers market represented on the poster. Markets operated by current FMC staff and board members are only eligible to win the Fan Favorite category. Winners from the 2014, 2016, 2017, 2018 poster contest are only eligible to win in the Fan Favorite category. Winners will need to submit a w-9 to FMC before receiving the award. Winners will be interviewed by FMC. FMC can use posters images to further the FMC mission. In addition, ALL entries will be entered into a raffle for a chance to win TWO tickets to the 2019 Farm Aid Concert! All winning posters will also be on display at the 2019 Farm Aid Concert (location TBD), and at National Farmers Market Week events in Washington, D.C.! Judging will occur between June 10-17th, 2019. Anyone can vote for the Fan Favorite poster on Facebook until 11:59pm ET on June 7th (one week after the contest entry period closes). To vote, “like” your favorite poster(s) on Facebook. Participants can vote for as many posters as they like! May I enter multiple posters for one market (for example, a basic one, and one that includes SNAP info)? I’m not the manager of my farmers market, but I’d like to submit its poster. May I? Yes! The market promoted in the poster will win the award money, not the person who submitted it. May I vote for more than one poster? Yes! Fan Favorite votes are based on Facebook likes and you can vote for as many as you’d like. Share to support your hometown market or favorite! My farmers market doesn’t have a poster. Can I make one and submit it to this contest? Yes! We’d love for you to do that. Just remember that the prize money goes to the market, not the creator of the poster. My market won a poster contest prize in 2014, 2016, 2017, or 2018. Is my market eligible to win a prize in this year’s contest? Yes! Markets that won a prize in the 2014, 2016, 2017, or 2018 poster contest are still eligible to win the Fan Favorite category. How long will it take for my entry to be added to the contest photo gallery on Facebook so fans can start voting? No longer than two (2) business days, beginning after April 29, 2019 (the official start date of the contest). Can I submit my poster entry prior to April 29, 2019, the official start date of the contest? Yes, but the entry will not be added to the Facebook contest photo gallery until on or shortly after April 29, 2019. All of the winners look like they were professionally designed, should I even bother entering? Yes! There are many ways to create a beautifully designed poster. Some of last year’s winning entries were designed by local artists, others by market staff or volunteers! Remember, we are looking for current 2019 posters, so if you don’t already have a poster designed, there’s still time for your to reach out to local artists, hold your own poster submission contest, find a designer that can make an in-kind donation, contact a graphic design student, etc. Involving your local supporters, shoppers, and partners in the design of your poster is a great way to engage your community! Who do I contact at FMC if I have questions or trouble entering?